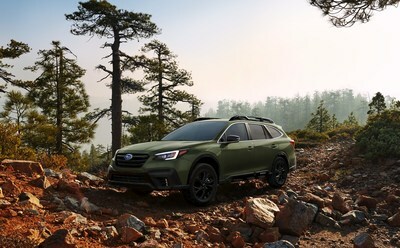 Subaru of America today introduced the all-new 2020 Outback offering the most advanced features, design and capability in its history. The sixth-generation SUV comes standard with Symmetrical All-Wheel Drive and Subaru's award-winning EyeSight Driver Assist Technology. With an available tablet-style 11.6-inch SUBARU STARLINK™ Multimedia system with integrated center information display, DriverFocus™ Distraction Mitigation System and new XT models with 260 horsepower, the 2020 Outback delivers greater technology, safety and performance than ever before. Built on the Subaru Global Platform, which provides increased safety, dynamics and quietness as well as reduced noise, vibration and harshness (NVH), the Outback will be available in Base, Premium, Limited, Touring, Onyx Edition XT, Limited XT and Touring XT models. 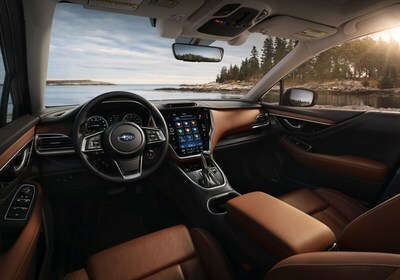 All 2020 Outback models are paired with a Lineartronic CVT featuring an 8-speed manual mode function with steering wheel paddle shifters. The 2.4-liter turbo delivers a 3,500-lb. towing capacity, the most of any Outback in history, while the 2.5-liter provides more than a 600-mile range on a single tank. Manufacturer's estimated fuel economy is 26/33 mpg city/highway for the 2.5-liter and 23/30 mpg city/highway for the turbo. Introduced for 2017, the Subaru Global Platform has been optimized for the Outback, boasting a structure that is 70-percent stiffer in both torsional and front-suspension rigidity and 100-percent stiffer in both front lateral flexural and rear subframe rigidity compared to the previous Outback's platform. Crash protection is improved, as the new body absorbs over 40-percent more energy in front/side crashes than the current model. When a crash is unavoidable, the Outback protects with eight standard airbags, including a driver knee airbag. Subaru expects the Outback to achieve top safety scores when it is tested later this year, including a Top Safety Pick+ rating from the Insurance Institute for Highway Safety (IIHS). Standard on all trims is Subaru's EyeSight Driver Assist Technology that now includes Advanced Adaptive Cruise Control with Lane Centering, which provides steering assist when the vehicle veers outside its lane, helping the driver maintain a direct path. Segment-exclusive DriverFocus Distraction Mitigation System uses a dedicated infrared camera and facial recognition technology to identify signs of driver fatigue or distraction and provides audio and visual warnings to alert the driver and passengers. Additional available driver-assist technologies include LED Steering Responsive Headlamps; Reverse Automatic Braking; Blind Spot Detection with Lane Change Assist and Rear Cross Traffic Alert; and EyeSight Assist Monitor with head-up display. The 2020 Outback offers a peaceful cabin that is almost 3 dB quieter at highway speeds. Subaru engineers worked extensively to find ways to reduce unwanted noise coming into the cabin, fitting the Outback with new door weather strips that feature a baffle in the mid-section and dual lips on the roof side for improved quietness. Sound-insulated glass, which uses a sound-insulating inner film for the windshield and front-door glass, has been adopted, while glass thickness all around has been increased for quietness. Limited and Touring models feature 10-way power front seats with lumbar support, adjustable cushion length (driver only) and heated front/rear seats. For 2020, seat heaters come with three levels of temperature adjustment as well as extended coverage up to the shoulders for improved comfort. Touring models add ventilated front seats and a heated steering wheel to their roster of standard features. Comfort and convenience in the Outback have been optimized for passengers with increases in rear head, shoulder and leg room. For powering and pairing personal devices, up to four USB ports and two 12-volt DC power sockets are available. With a cargo floor length of 78 inches with the rear seatbacks folded, the 2020 Outback offers up to 75.7 cu ft of cargo space. And with a wider rear gate opening, the Outback can comfortably accommodate long items such as camping gear, golf clubs or strollers. For added convenience while loading the vehicle, a new Hands-Free Power Gate allows the owner to open the rear gate by simply waving in front of the Subaru emblem (positioned in the center of the rear gate) as well as a new single-touch lifting cargo cover. Both features are a first for Subaru and are standard on most 2020 Outback models. For additional cargo versatility, the Outback offers standard roof rails with integrated and retractable cross bars and tie-downs. Following a "Dynamic x Solid" philosophy, the all-new Outback is anchored to an "Active x Tough" concept. The result is a rugged and functional design that inspires wanderlust and enables active lifestyles. The 2020 Outback projects a large presence from thicker profile panel surfaces and raised rear gate as well as a sense of speed from its dynamic silhouette. Wider fenders, large hexagonal grille, front cladding and LED fog lights on the corners (standard on all trims except Base) emphasize the SUV's capability. Cladding on the side of the Outback is meant to resemble a hiking boot that further enhances this concept. The interior design uses a widened windshield and long lines from the center of the instrument panel to the door panels to create an open environment. The Outback Touring leverages luxurious appointments inside and out, including Nappa leather, high-gloss black molding for the pillars, chrome plating decorated door handles and satin tone plated side mirrors. SUBARU STARLINK In-Vehicle Technology offers an integrated cockpit experience by allowing the driver to control entertainment and vehicle settings through a large touchscreen display. All STARLINK multimedia systems for the 2020 Outback feature a high-resolution touchscreen; new on-screen controls for audio, HVAC, X-MODE and vehicle features; combination meter integration; smartphone integration with Apple CarPlay™, Android™ Auto and new STARLINK SmartDeviceLink™ apps; Bluetooth® hands-free phone and audio streaming connectivity; AM/FM stereo; Rear Vision Camera; SiriusXM® All Access Radio (4-month free subscription) and SiriusXM Travel Link® (3-year free subscription); HD Radio® and over-the-air updates. Front and center, and highlighting Outback's upscale interior, is an all-new tablet-style 11.6-inch Full HD multimedia display, the largest, most advanced infotainment screen ever in a Subaru. Standard on all but the Base trim, the 11.6-inch Multimedia display offers direct touch controls for multimedia, HVAC, X-MODE and vehicle settings, and includes Near Field Communication to its list of features. Like with a smartphone, app icons can be moved and configured based on personal preference. The 2020 Outback will be the first vehicle to offer the new Chimani app, which provides a comprehensive guide to more than 400 national parks in the U.S. and includes park history and highlights written by local traveler experts. The top-of-the-line 11.6-inch Multimedia with Navigation adds navigation powered by TomTom® and voice activated navigation. For the first time in Outback, available in-vehicle Wi-Fi hotspot provides smooth internet access via high-speed LTE™ communications. Framing the large multimedia screen is a new multilayer instrument panel featuring a soft-touch wrapped surface with available real double-stitching for a high-quality appearance. The wrapped surface material and stitching employ the same color combination as the seats and door trim for a uniform look and feel. An available 12-speaker Harman Kardon® audio system, with Clari-Fi™ compressed audio restoration technology and GreenEdge™ high-efficiency speakers and amplifier, delivers premium sound. Pricing for the 2020 Outback will be announced closer to this fall's on-sale date.